"ETI's Audience Response System was a very useful tool - making our event more interactive, engaging and fun, while providing our client with tangible feedback." GET FREE AUDIO CONFERENCING FROM KICK CONFERENCING! Would you like to learn how Audience Response Systems can enhance and improve your event? Contact us for more information and a free quote! How does the Audience Response System work? Audience Response Systems offer the ability to interact with your audience through the use of common technology, enabling the presentor to display valuable question and reply scenerios. Questions with a numbered range of choices are displayed on a video projection screen. 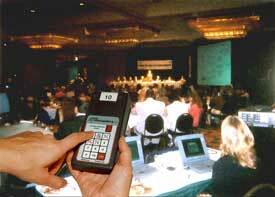 Audience members respond to the questions using the wireless handheld keypads. Using the keypads is simple. The ARS allows your audience to respond anonymously to the questions presented or you may choose to assign keypads to participants. When the question is presented on the video screen, participants enter the number associated with their choice (1-10, A-E, YES/NO, True-False). Within seconds a result graph is displayed reflecting the group's collective response. The data is stored on disk and can be sorted by individual attendee and/ or pre-determined demographic groups. At the end of your event, you walk away with the response data in your hands. You will receive the data on disk and report viewer software to view it at your desktop. When the pre-programmed questions are presented on the video screen, participants enter the number associated with their choice (1-10, A-E, YES/ NO, True-False). Within seconds a result graph is displayed reflecting the team or individual response and who scored points on the question. Intermittently, throughout the game, a Team Standing or Individual Standing screen will be displayed to show who is winning. Who Wins? The team or person with the most points. We will work with you to design a format that is personalized for your audience and event message. Copyright Event Technolgies, Inc., 2019 . All Rights Reserved.